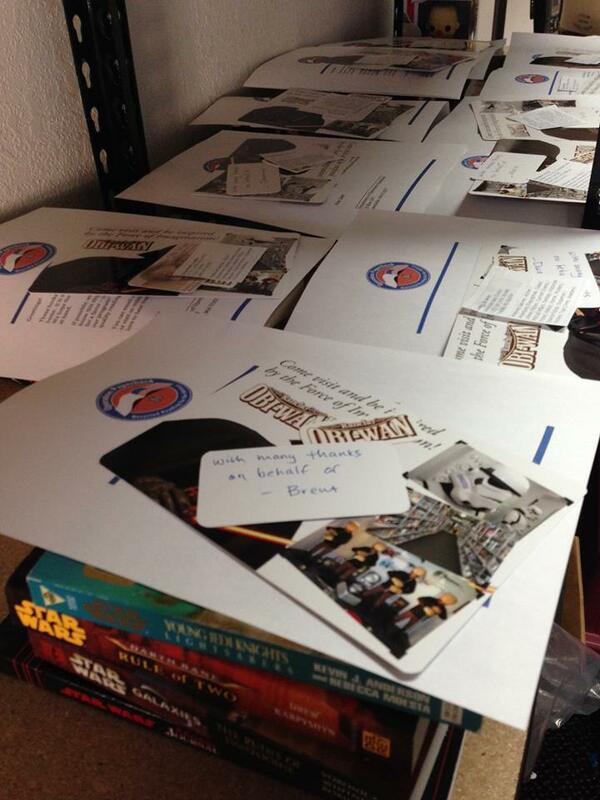 Our podcasting event, The Kessel Run garnered 20 boxes of books for military families! This past Sunday Steve Sansweet, Consetta Parker and a few other amazing Rancho Obi-Wan volunteers boxed up a whopping 20 boxes full of books bought with your donations to Rancho Obi-Wan and Operation Paperback. During the Kessel Run podcast event your donations amounted to an amazing $650 and now through Operation Paperback that money has turned into Star Wars books on their way to members of the military and their families. Today, super Rancho volunteer Dan Norgan and I are packing 20 boxes of books to go to military troops, veterans and families. Thanks to the donors from our recent Kessel Run podcast fundraiser we are donating the books via Operation Paperback, an organization that matches book donors with members of the military. Thank you to all the podcast participants and donors!! !— with Steve Sansweet, Anne Neumann, Consetta Parker, Dan Norgan and Stephen J. Sansweet. We thank you again for your amazing donations and your participation in this unprecedented 8 hour podcast marathon! We hope you will continue to donate to Rancho Obi-Wan throughout the year, and join us again for the next Kessel Run fundraiser! Also a big thank you again to our podcasters for joining in on the discussion. We’re incredibly grateful that you all could join us! Steve Sansweet from Rancho Obi-Wan! Consetta Parker from Rancho Obi-Wan! Mike and Joao of The Cantina Cast! Dunc and Jawa James from Club Jade! Dion from Star Wars Always! Dan and Cory from Coffee with Kenobi! And his worshipfullness, Chris from the Star Wars Kidscast!